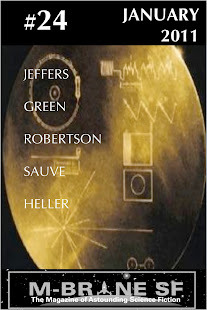 M-Brane SF is proud to announce a new story collection by author Derek J. Goodman. 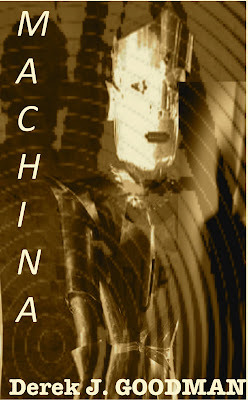 Machina will contain four short stories and novellas centered around machines and the way they affect the people around them. Sometimes they are part of the background, sometimes they are heroes and villians, but they always have a bigger impact than it would initially appear. At the center of Machina is Derek's story "Dea Ex Machina," the story of a man who has sold himself to a factory and been turned into a mindless drone through magic. But as the magic begins to wear off, he questions the reasons he ended up in the factory to begin with, and starts to wonder if there might be some truth to the stories that, among the magic of the factory, there really is a goddess in the machines. This story is currently being adapted as an opera, and will be performed by the Crucible in Oakland in January 2011. We will release this book in April 2010 with an introduction by Mark Streshinsky, the producer and librettist for Machine, the opera adapted from "Dea Ex Machina." The accompanying image is not necessarily the real cover art. I would be interested in having something more directly inspired by "Dea Ex Machina" as described above. Interested artists should email me at mbranesf at gmail dot com. The gig doesn't really pay much of anything, but I might be able to come up with a modest honorarium or perhaps a royalties share. I just read Derek's machine interactive story in Things We Are Not. I thought it was pretty damn hot. I'm not sure I understand the format of this one. Is it paperback or PDF? This will be issued as a trade paperback as well as in the various electronic formats.